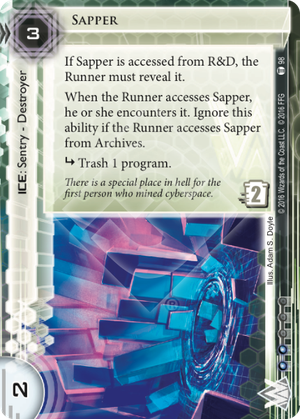 Sapper is the first trap that you can fire from R&D/HQ that can trash a program (and this is where it shines tbh, it is a really crappy piece of ice - i shall retract this statement i was bitter about mimic at the time) , and as easy as it is to play around (by having a killer) you still have to play around it which is what makes this card important. Having played sapper a reasonable amount recently, this card really shines in decks that aim to rush. It adds an extra layer of psuedo gearcheck. Against rush decks, most players will focus on finding their fracter early. Sapper means that central pressure without a killer installed becomes risky buisness. The combination of these two things means that sapper has the effect of slowing down runners that play around it whilst losing the corp no tempo and doubling up as a decent enough piece of ICE. This card is interesting, but I think it has some serious problems. If the "when accessed" bit is firing, then they are getting in to the central servers, and that means one of two things: Either there is no ICE protecting them yet, or there is ICE, but they can break it. Neither of these are really great scenarios for Sapper. If there is no ice protecting HQ or R&D, then it's probably early-game, and there is a good chance that the runner doesn't have any programs installed either. Sapper might get to fire, but it's not going to do much. If there is ice protecting the centrals and they broke it, then there's a good chance that they can break it, too. So really, it's only going to get to fire during that thin sliver of the game where the runner has installed programs, but doesn't have the tools (or credits) to break Sapper. The tax on it is pretty pitiful. Even if they are forced to break it, it's not going to be very costly. Sentries aren't usually cheap to break, but 2 strength is not terribly frightening. A lot of sentry breakers and AIs start at 2 strength.) Tax-wise, the best you can probably hope for is to make them spend 3 breaking it with Mongoose or possibly burn a Faerie. I could see this ice being useful if Marcus Batty ever recovers from the severe drubbing he's currently receiving at the hands of Rumor Mill and Interdiction, but at the moment, it's hard to get too excited about it. Chrysalis is an obvious card to compare it against, but Chrysalis just seems better, as its subroutine is still useful, even in the rare phase of the game where it is likely to get to fire.